, younger brother of the preceding Dr. John Smith, and the munificent provost of Queen’s college, Oxford, was born at Lowther, Oct. 10, 1670. 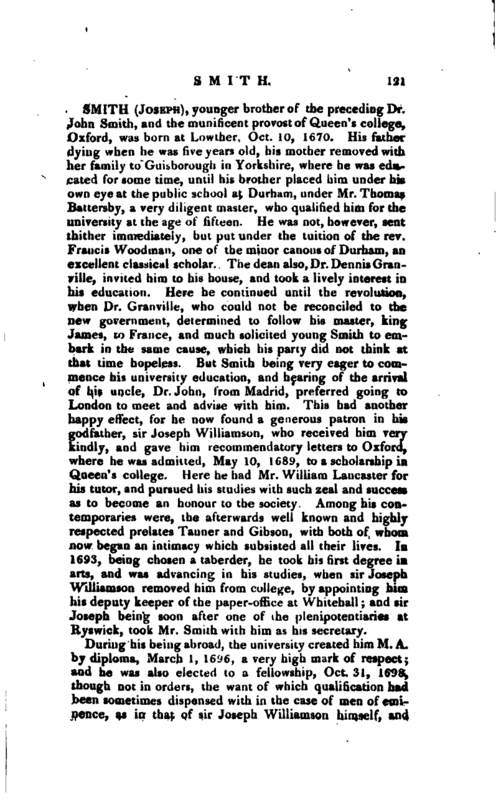 His father dying when he was five years old, his mother removed with her family to Guisborough in Yorkshire, where he was educated for some time, until his brother placed him under his own eye at the public school at Durham, under Mr. Thomas Battersby, a very diligent master, who qualified him for the university at the age of fifteen. He was not, however, sent thither immediately, but put under the tuition of the rev. Francis Woodman, one of the minor canons of Durham, an excellent classical scholar. The dean also, Dr. Dennis Granville, invited him to his house, and took a lively interest in his education. Here he continued until the revolution, when Dr. Granville, who could not be reconciled to the new government, determined to follow his master, king James, to France, and much solicited young Smith to embark in the same cause, which his party did not think at that time hopeless. But Smith being very eager to commence his university education, and hearing of the arrival of his uncle, Dr. John, from Madrid, preferred going to London to meet and advise with him. This had another happy effect, for he now found a generous patron in his godfather, sir Joseph Williamson, who received him very kindly, and gave him recommendatory letters to Oxford, where he was admitted, May 10, 1689, to a scholarship in Queen’s college. Here he had Mr. William Lancaster for his tutor, and pursued his studies with such zeal and success as to become an honour to the society. Among his contemporaries were, the afterwards well known and highly respected prelates Tanner and Gibson, with both of whom now began an intimacy which subsisted all the-ir lives. In 1693, being chosen a taberder, he took his first degree in arts, and was advancing in his studies, when sir Joseph Williamson removed him from college, by appointing him his deputy keeper of the paper-office at Whitehall; and sir Joseph being soon after one of the plenipotentiaries at Ryswick, took Mr. Smith with him as his secretary. During his being abroad, the university created him M. A. by diploma, March 1, 16‘j6, a very high mi.rk of respect; and he was also elected to a fellowship, Oct. 31, 1698, though not in orders, the want of which qualification had been sometimes dispensed with in the case of men of eminence, as in that of sir Joseph Williamson himself, and | Tickel the poet. While abroad, he visited some foreign courts along with his patron, and was no inattentive observer of the political state of each, as appears by some memoirs he left in ms. concerning the treaty of Ryswick; and he had also a s’hare in the publication of “The Acts and Negotiations, with the particular articles at large of that peace.” Those circumstances, with the talents he displayed both in conversation and correspondence, procured him very flattering offers of political employment!, both from the earl of Manchester and sir Philip Meadows, the one ambassador at the court of France, the other envoy to that of Vienna. But, although he had fully enjoyed the opportunities he had abroad of adding to his knowledge of the world, his original destination to the church remained unaltered, and to accomplish it he returned to Oxford in 1700, where he was gladly received. He was then ordained by Dr. Talbot, bishop of Oxford, and was heard to say, that when he laid aside his lay habit, he did it with the greatest pleasure, as looking upon holy orders to be the highest honour that could be conferred upon him. 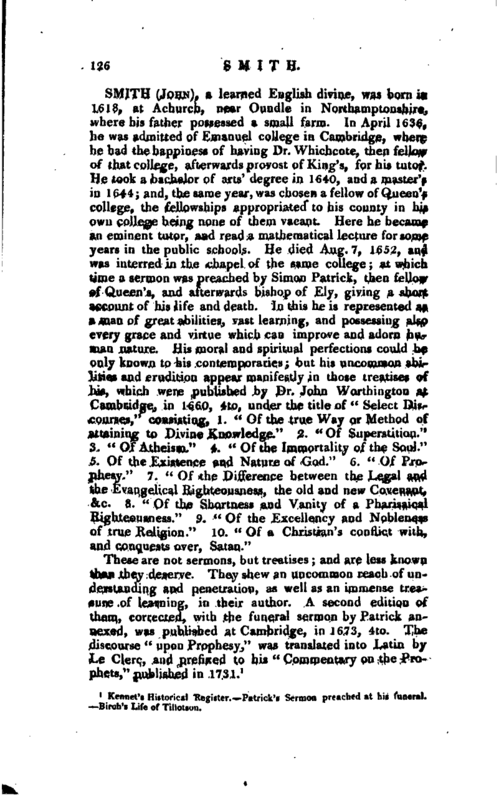 It was not long before be entered into the more active service of the church, Dr. Halton, then provost of Queen’s college, and archdeacon of the diocese, having presented him to the donative of Iffley near Oxford, and at the same time appointed him divinity-lecturer in the college. The lectures he read in this last character were long remembered to his praise. On queen Anne’s visiting the university in 1702, Mr. Smith was selected to address her majesty; and in 1704, he served the office of senior proctor with spirit and prudence, and constantly attended the disputations and other exercises in the public schools. 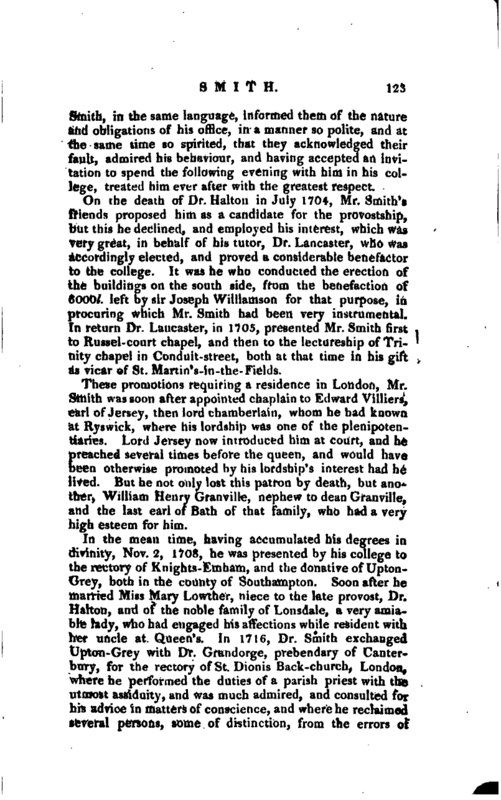 At this time it appears he had the appellation of “handsome Smith,” to distinguish him from his fellow- proctor, Mr. Smith of St. John’s college, who had few personal graces. They were equally attentive, however, to their duties, and in their attendance on the public disputations, which made Tickel say on one occasion, “there was warm work at the schools, for that the two Smiths made the sparks fly” In the exercise of this office, Mr. Smith coming to a tavern, where was a party carousing, one of whom happened to be a relation of prince George of Denmark, he admonished them for their irregularity, which they considered as an intrusion, and made use of the French language, which they thought he did not understand, to speak disrespectfully of him. 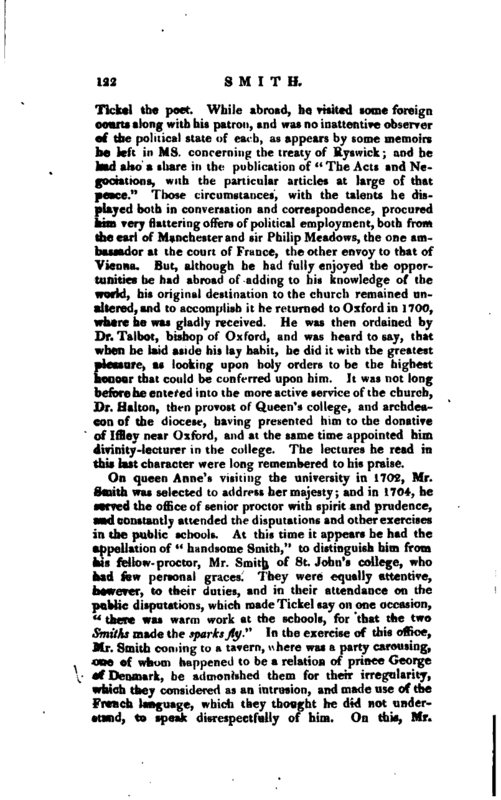 On this, Mr. | Smith, in the same language, informed them of the nature and obligations of his office, in a manner so polite, and at the same time so spirited, that they acknowledged their fault, admired his behaviour, and having accepted an invitation to spend the following evening with him in his college, treated him ever after with the greatest respect. 6000l. left by sir Joseph Williamson for that purpose, in procuring which Mr. Smith had been very instrumental. In return Dr. Lancaster, in 1705, presented Mr. Smith first to Kussel-court chapel, and then to the lectureship of Trinity chapel in Conduit-street, both at that time in his gift as vicar of St. Martin’s-in-the- Fields. These promotions requiring a residence in London, Mr. Smith was soon after appointed chaplain to Edward Villiers, earl of Jersey, then lord chamberlain, whom he had known at Ryswick, where his lordship was one of the plenipotentiaries. Lord Jersey now introduced him at court, and he preached several times before the' queen, and would have been otherwise promoted by his lordship’s interest had he lived. But he not only lost this patron by death, but another, William Henry Granviile, nephew to dean Granville, and the last earl of Bath of that family, who had a very high esteem for him. In the mean time, having accumulated his degrees in divinity, Nov. 2, 1708, he was presented by his college to the rectory of Knights-Emham, and the donative of UptonGrey, both in the county of Southampton. Soon after he married Mis.s Mary Lowther, niece to the late provost, Dr. Halton, and of the noble family of Lonsdale, a very amiable lady, who had engaged his affections while resident with her uncle at Queen’s. In 1716, Dr. Smith exchanged Upton -Grey with Dr. Grandorge, prebendary of Canterbury, for t’ie rectory of St. Dionis Back-church, London, where he performed the duties of a parish priest with the utmost assiduity, and was much admired, and consulted for his advice in matters of conscience, and where he reclaimed several persons, some of distinction, from the errors of | popery, and was a great benefactor to the repairs of the church, over which he presided for forty years. He likewise annually bought a great number of religious tracts, which he liberally distributed among his parishioners. 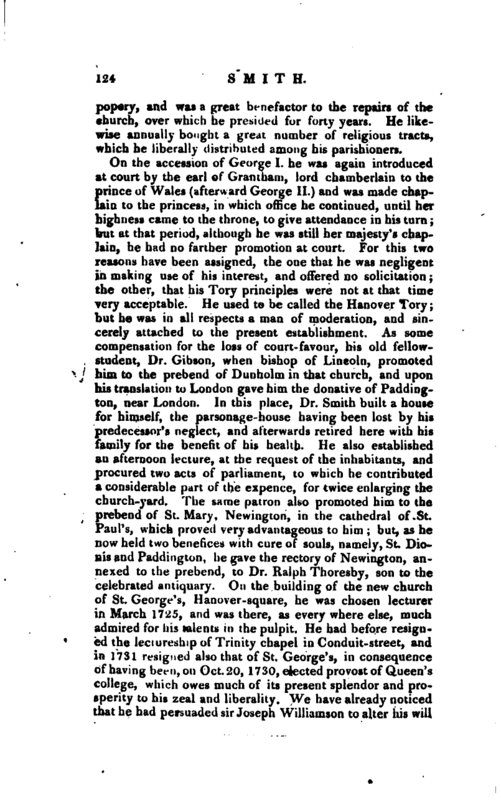 On the accession of George I. he was again introduced at court by the earl of Grantham, lord chamberlain to the prince of Wales (Afterward George II.) and was made chaplain to the princess, in which office he continued, until her highness came to the throne, to give attendance in his turn; but at that period, although he was still her majesty’s chaplain, he had no farther promotion at court. For this two reasons have been assigned, the one that he was negligent in making use of his interest, and offered no solicitation; the other, that his Tory principles were not at that time very acceptable. He used to be called the Hanover Tory; but he was in all respects a man of moderation, and sincerely attached to the present establishment. As some compensation for the loss of court-favour, his old fellowstudent, Dr. Gibson, when bishop of Lincoln, promoted him to the prebend of Dunholm in that church, and upon his translation to London gave him the donative of Paddington, near London. In this place, Dr. Smith built a house for himself, the parsonage-house having been lost by his predecessor’s neglect, and afterwards retired here with his family for the benefit of his health. He also established an afternoon lecture, at the request of the inhabitants, and procured two acts of parliament, to which he contributed a considerable part of the expence, for twice enlarging the church-yard. The same patron also promoted him to the prebend of St. Mary, Newington, in the cathedral of St. Paul’s, which proved very advantageous to him; but, as he $ow held two benefices with cure of souls, namely, St. Dionisand Paddington, he gave the rectory of Newington, annexed to the prebend, to Dr. Ralph Thoresby, son to the celebrated antiquary. On the building of the new church of St. George’s, Hanover-square, he was chosen lecturer in March 1725, and was there, as every where else, much admired for his talents in the pulpit. He had before resigned the lectureship of Trinity chapel in Conduit-street, and in 1731 resigned also that of St. George’s, in consequence of having been, on Oct. 20, 1730, elected provost of Queen’s college, which owes much of its present splendor and prosperity to his zeal and liberality. We have already noticed that he had persuaded sir Joseph Williamson to alter his will | in its favour, which had before been drawn up in favour of endowing a college in Dublin; and it was now to his interference that the college owed the valuable foundation of John Michel, esq. for eight master fellows, four bachelor scholars, and four undergraduate scholars or exhibitioners, besides livings, &c. Dr. Smith was also instrumental in, procuring queen Caroline’s donation of 1000l. lady Elizabeth Hastings’s exhibitions, and those of sir Francis Bridgman, which, without his perseverance, would have been entirely lost; and besides what he bequeathed himself, he procured a charter of mortmain, in May 1732, to secure these several benefactions to the college. During his provostship, which lasted twenty-six years, he was sensible of the infirmities of age, and was a great sufferer by acute complaints, particularly the strangury, which he bore with great resignation, and was always cheerful, active, and liberal. He passed much of his time at a villa at Kidlington, where he had purchased a manor and estate, but went up to London for some part of the year, and officiated at St. Dionis church. 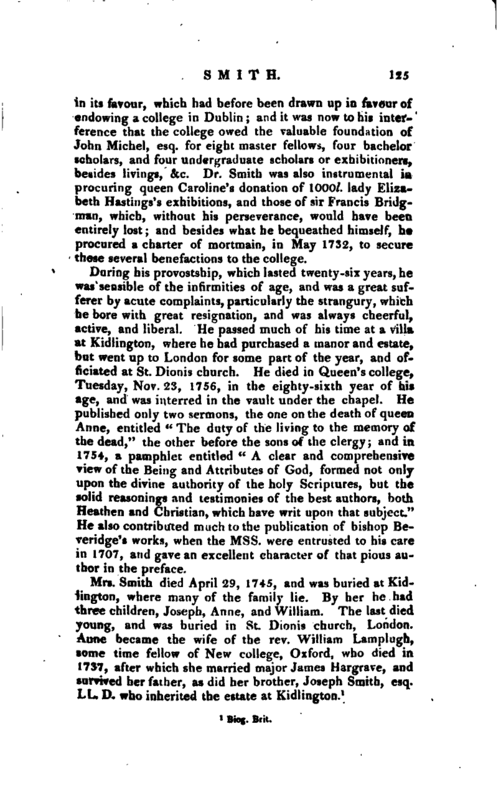 He died in Queen’s college, Tuesday, Nov. 23, 1756, in the eighty-sixth year of his age, and was interred in the vault under the chapel. He published only two sermons, the one on the death of queen Anne, entitled “The duty of the living to the memory of the dead,” the other before the sons of the clergy; and in 1754, a pamphlet entitled “A clear and comprehensive view of the Being and Attributes of God, formed not only upon the divine authority of the holy Scriptures, but the solid reasonings and testimonies of the best authors, both Heathen and Christian, which have writ upon that subject.” He also contributed much to the publication of bishop Beveridge’s works, when the Mss. were entrusted to his care in 1707, and gave an excellent character of that pious author in the preface.